Our NurseCall System has the power to efficiently manage Nurse Call System alarms and staff responses. It meets all the needs of a hospital, nursing home, and an assisted-living facility. 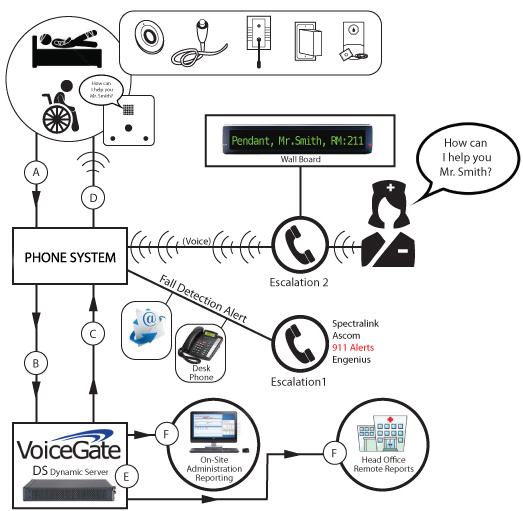 The Nurse Call System is the communications link between patient, caregivers & management. The system has levels of routine, emergency and code/fire to notify staff or nurse. Portable pendants that allow residents in a nursing home to travel throughout the home knowing that help is always a button press away. The system dispalys calls, provides detailed reports on all system activity. Resident / Patient activities Nurse Call. specific to that call trigger (pendant, flood, smoke detector, etc.). based on nurse/ caregiver assignment by shift. Once the caregiver answers, the speech path is opened into the room. DS logs the trigger event and Nurse’s response time to respond into the room.